The Institution is delighted to announce the conferment of the HKIE Gold Medal on Ir Prof W K Chow at the 43rd Annual Dinner. The Award was set up to bestow distinction on an outstanding member and to recognise commendable achievements and remarkable contributions to his/her fields of engineering. Ir Prof W K Chow is Chair Professor of Architectural Science and Fire Engineering, and Director of the Research Centre for Fire Engineering at the Department of Building Services Engineering of The Hong Kong Polytechnic University. In these capacities he has contributed a great deal to academia, and is an acknowledged expert in his field. He read for his Bachelor's Degree at The University of Hong Kong and graduated with first-class honours in 1977. In 1979 he graduated from Portland State University, Portland, Oregon, in the USA with a Master's Degree. He returned to The University of Hong Kong and completed his Ph.D. Degree in 1983. He joined the Department of Building and Surveying, and then the new Department of Building Services Engineering, of the then Hong Kong Polytechnic in 1981 as an Assistant Lecturer. Subsequently, he was promoted to Lecturer in 1982, Senior Lecturer in 1988, Principal Lecturer in 1989, Reader/Professor in 1994, and became Chair of Building Services Engineering in 1998. This was retitled to Chair Professor of Architectural Science and Fire Engineering later in the same year. He served as the Head of the Department of Building Services Engineering from 2009 to 2016. Over the past 36 years, Ir Prof Chow has contributed to the provision of a safe, comfortable and healthy environment for sustainable buildings with tall height, large space volumes, and those located deep underground. His contributions have been achieved through research, university teaching, high-level consultancy projects, and assisting the Government in approving fire safety designs for large construction projects through performance-based designs in Hong Kong, and services for professional institutions. He assisted in establishing the Building Services Discipline in the 1980s, and the Fire Engineering Discipline in the 2000s for the HKIE. 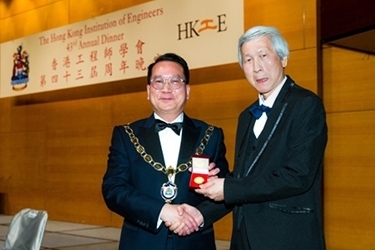 Ir Prof Chow was elected Fellow of the Hong Kong Academy of Engineering Sciences in December 2012. He is a Fellow of the HKIE and many other professional engineering institutions. He was appointed as a Justice of the Peace by the Chief Executive of the HKSAR in July 2013. He was awarded the Lifetime Contribution Award by the Asia-Oceania Association for Fire Science and Technology in October 2015. He has been the Founding President of the Society of Fire Protection Engineers (SFPE) – Hong Kong Chapter since 2002, President of the Asia-Oceania Association for Fire Science and Technology since 2007, and Chair of Asia-Oceania Chapters Coordinating Group, SFPE since 2015. He was elected to the SFPE Board of Directors from 2016 to 2019. Ir Prof Chow has published over 1,000 articles, of which over 300 articles have appeared in internationally refereed academic journals cited by the Science Citation Index (SCI). He has also successfully supervised over 60 Ph.D. candidates.